egg in a hole. – Kids’ breakfast or snack recipe, making this is a fun and kids will absolutely love this. I watched this sometime ago in a kids’ television show and loved the idea. Made it several times for my kids. They started liking it and i made it often for the evening snack or the weekend breakfast. Thought of sharing it here so that many of you can try for your kids. To make this, the center of the bread is cut using a cookie cutter or any cutter to make a hole. Then the egg yolk and white are added to the hole. Salt and seasonings are sprinkled and baked in a preheated oven. That’s it, egg in a hole is ready under 15 mins. 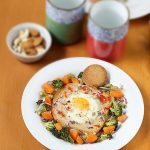 I always prefer to serve eggs to my family with veggies. So i toss some mixed veggies in olive oil, herbs and then bake them together. A healthy, whole some and nutritious breakfast is ready. This can also be made on a pan. Instructions included in the recipe card below. 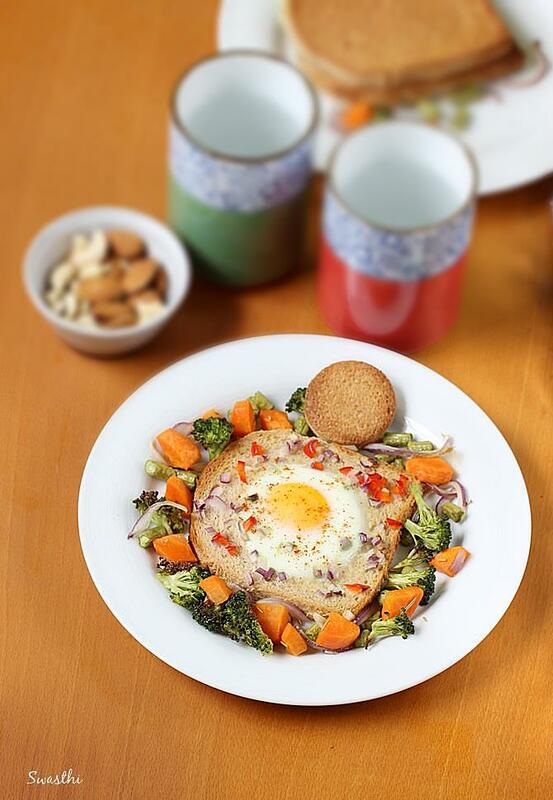 You may like this collection of egg recipes for breakfast & snack. baked egg in a hole. Toss veggies in salt, pepper, rosemary and olive oil. Trim the edges of bread. Butter them. 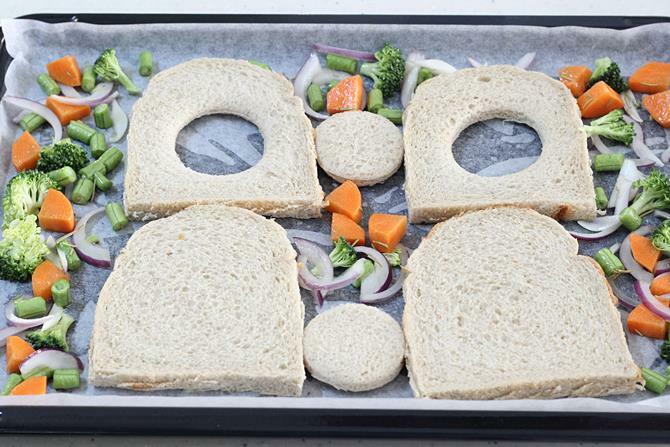 Cut 2 bread slices with a cookie cutter in the center to remove the center portion of the bread. Line a baking tray. Place the bread slices. Spread the veggies. 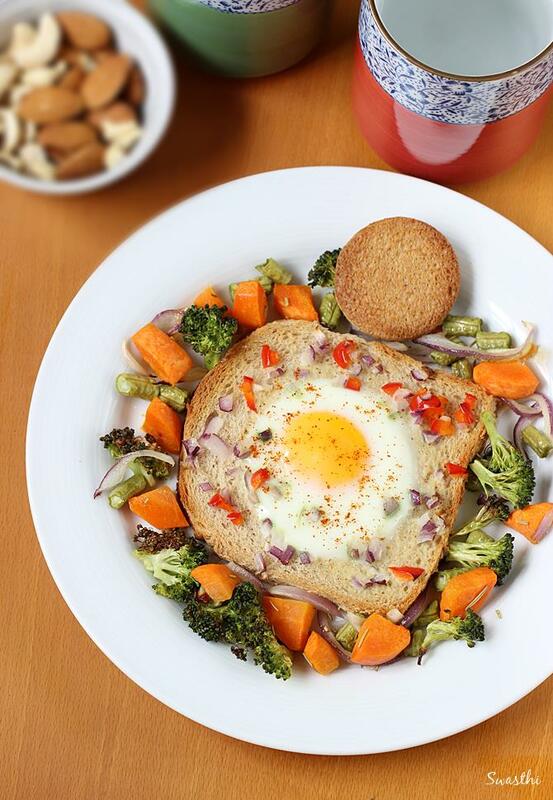 Break the egg and pour in the hole or center. Sprinkle salt, paprika, pepper over the egg. Bake for 10 to 12 minutes at 200 C in a preheated oven. Over baking can make the yolk hard, so bring the pan out of the oven when the yolk is just set or cooked. To make on the pan, heat a pan with butter, place the bread slices. Break the egg and pour it to the hole. Cook on a low to medium heat until the yolk looks partially set. Flip the bread and cook until done. Very Creative, kids will love this. Looks so inviting. 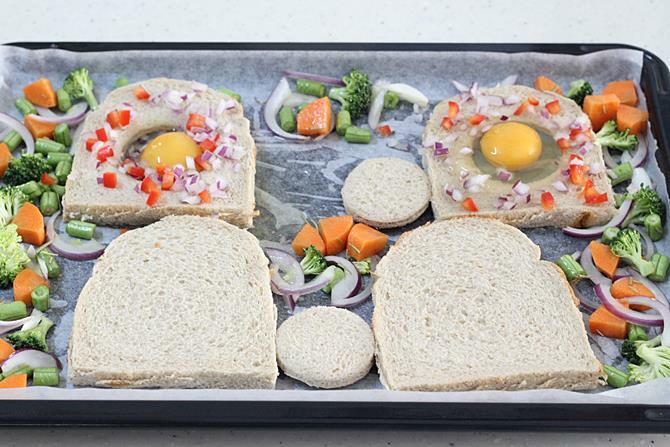 Sure to make your breakfast super yummy and interesting.